How to Handle Income Tax (IT) Department Notices? Notice under Section 142(1) is usually served to call upon documents and details from the tax payers. Prosecution under Sec 276D which may extend upto 1 year with or without fine. This notice is basically sent after notice u/s 142(1) has already been sent. It means AO was not satisfied with the produced documents or may be AO has not received any documents. This notice can be served upto 6 months after completion of relevant assessment year. The AO can reduce the income below the returned income and can assess the loss higher than the returned loss under Scrutiny Assessment as per Sec 143(3). The notice might ask you to produce documents in support of deductions, exemptions, allowances, reliefs other claim of loss you have made and provide proof of all sources of income. Section 143(2) enables the Assessing Officer to make a regular assessment after a detailed inquiry. Intimation where the notice is to be simply considered as final assessment of your returns since the AO has found the return filed by you to be matching with his computation under section 143(1). 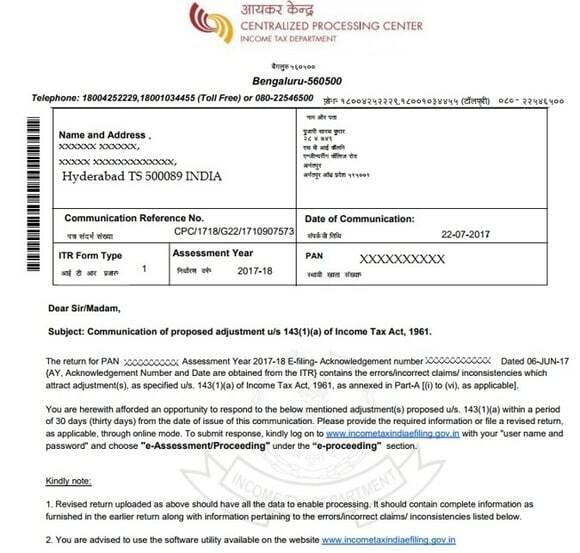 A refund notice, where the officer’s computation shows amount excessively paid by the assessee. Time limit for the notice to be served is up to 1 year after completion of relevant assessment year. If AO has reasons to believe that any income chargeable to tax has escaped assessments, he may assess or reassess such income, which is chargeable to tax and has escaped assessment. To initiate proceedings under Sec 147, the AO is required to have a reason necessarily. The onus of stating the reasons is on AO. Where any tax, interest, penalty, fine or any other sum is payable in consequence of any order passed, the AO shall serve upon the assessee a notice of demand, specifying the sum do payable. The tax so demanded is payable, generally within 30 days of the service of notice of demand, which may be reduced by the AO with prior approval of JCIT. In case of delay in payment of tax, the assessee shall be deemed to be in default and liable to pay simple interest u/s 220(2) @ 1% for every month or part thereof from the end of the period allowed u/s 156, further penalty u/s 221(1) may be imposed. What is a Defective Return? – A return shall be considered as a defective return unless it is accompanied by the required documents under the Act.eg -e.g. – Annexures, statements, proofs of tax, reports etc. If the AO considers that the return filed by the assessee is defective, he may intimate the defect to the assessee and gave him an opportunity to rectify the defect within 15 days from the date of such intimation or within such extended period as may be allowed by the AO. If the defect is not rectified within the aforesaid period, the return shall be considered as an invalid return and accordingly the assessee will be deemed to have furnished no return. Where any amount of refund is pending to the assessee and also any sum is payable under the Act, the AO may adjust the amount to be refunded with the sum payable by the assessee. Basically it can be related to the ‘inter adjustment of transactions’. Notice under Section 245 is more of intimation letter and less of demand notice. Under this notice, the AO intimates the effect of the adjustments made with the amount due to assessee. It indicates the adjusted amount which can be either merely intimation or demand notice of lesser amount still payable after the adjustment.